Orange County has a reputation for its diverse population, a large part of which is dominated by the Vietnamese community. This results in hundreds of Vietnamese restaurants spread across the county with the highest density located in the Garden Grove and Westminster cities. However, what if you don't live in those areas, don't feel like venturing in that direction, and are craving Vietnamese food? Fountain Valley dwellers don't need to fret because Hong Hai Dining has come to town, built upon the successful restaurant in Vietnam by a similar name (Hong Hai Seafood). Owners Nhu and Dan White opened the restaurant's doors in January 2015 to a much welcome reception by the community. Based on Nhu's mother's restaurant in Vietnam which has been serving seafood for many years and with the goal of keeping it very much family-run, Hong Hai features some Vietnamese dishes that are familiar but uniquely, serves specials brought over from its namesake which we were intrigued to learn more about. We were invited in to give them a try and quickly discovered some specials worth coming back for. Armed with the family recipes of her mother's restaurant and her own experience in the restaurant industry for seven years from busser to manager, Nhu put together Hong Hai with a modern look and feel in mind to match the quality of the food itself. They use several different techniques such as cooking their shrimp appetizer in fresh coconut juice as well as carrying housemade sauces such as the family's recipe for a green chile dipping sauce. 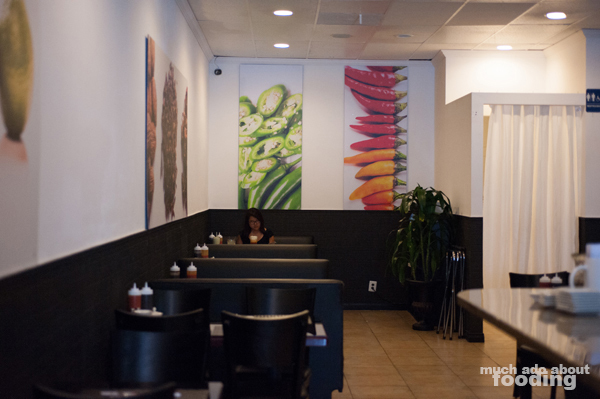 When you walk into the restaurant, tall and vibrant canvased photographs of individual ingredients common to the Vietnamese cuisine line the walls to invite you. Black and white elements give stark contrast but also play to a modern tune, a move that helps attract both old and young. We begun with our drinks which were a difficult choice considering how many options there were. Their popular Lychee Infused Tea ($2.95), Fresh Passion Fruit Soda ($3.25), and Fresh Strawberry Limeade Soda ($3.25) items are made with fresh fruits so that was mightily tempting but then we spotted their Thai Ice Tea ($2.75) with sea salt cream and the Fresh Avocado Smoothie ($3.50). Both were done well and not too sweet as their kind can veer towards being. 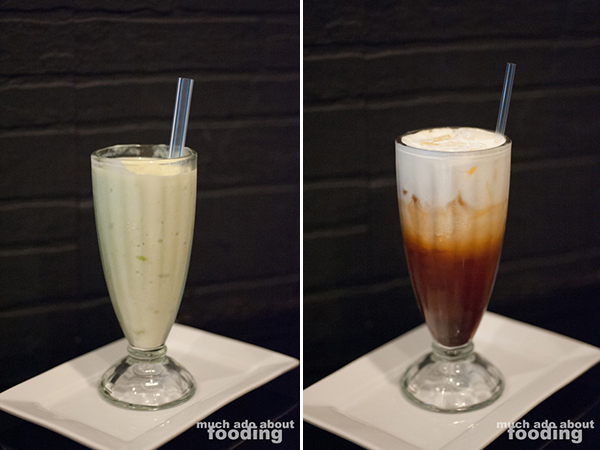 I enjoyed the touch of sea salt cream on top of the Thai ice tea to add a different taste dimension while Duc enjoyed the richness of the smoothie. Perusing the appetizer menu, we saw some good choices but asked for a few fan favorites. One was their Rocket Shrimp Rolls (4 for $6.95) and another was the Salt and Pepper Calamari ($9.95 - flash-fried calamari rings sauteed with garlic, green onions, and jalapenos) which we opted for to start with. It is slightly different from traditional Italian calamari dishes you may be used to though because instead of being melt-in-your-mouth soft, these pieces had more of a bite to it in texture, not in the way of being overcooked but purposefully done. Nhu pointed out that it is more common for Vietnamese-style to be this way, and their customers enjoy it to the point that some tables put in for multiple orders in one sitting! 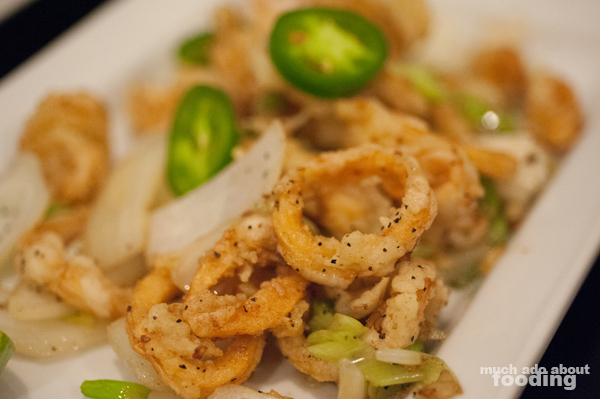 We're accustomed to this more resistant type of texture as well which is not rubbery nor is it completely soft; the calamari is still quite tender. We enjoyed the batter on it immensely, especially for how peppery it was. To make the menu items both authentic and special, Hong Hai favors its designated Specials which are signature items from the mother restaurant in Saigon, Hong Hai Seafood. We jumped immediately on the Fresh Baby Clams Bathed in Hong Hai Spicy Broth ($9.95 - live Manila clams bathed in fresh ginger and lemongrass chili broth) for our next appetizer; these were a pleasant level of spiciness but not overbearing. They were also incredibly fresh and the flavors addicting. 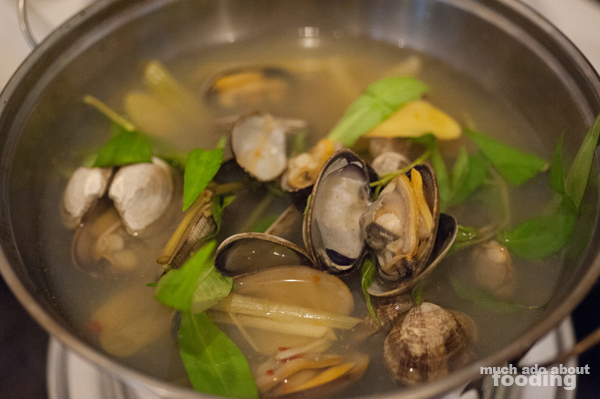 Though when it arrives, it does not look much more than clams in a thin broth, the dish is quite enjoyable and easy to finish very quickly. 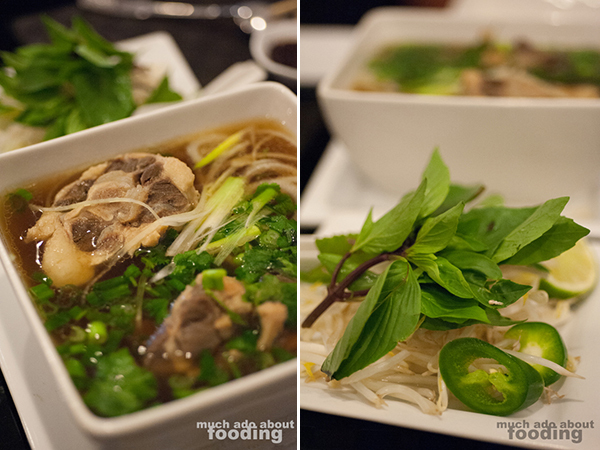 We moved on next to their Oxtail Noodles Soup ($8.95 - one size only, served with beansprouts, basil, and culantro) which is their oxtail phở, a dish sought by many phở lovers but not as readily available at any of the many phở restaurants in Orange County. 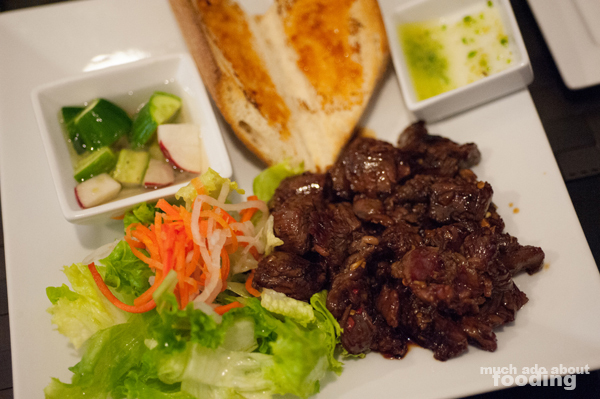 Their menu boasts 14 varying selections of phở but you could always customize the type of meats you do and don't want in your bowl. This particular one only comes in one size and is the product of Nhu's brother-in-law's cooking. He had worked in his own family's phở restaurants for more than 10 years and has transitioned to being Hong Hai's chef and basically, phở master. The broth draws many customers in and with good reason too. We enjoyed the rich flavor and the noodles cooked to the right texture; there was a little bit of more oil in the broth than we would have liked though but that is merely a preference. Our last pass at their entrees was the Hong Hai Style Grilled Filet Mignon ($9.95 - grilled filet mignon cubes with Hong Hai's special sauce served with pickled cucumber, salad, and baguette) which many may at first mistake for bò lúc lắc (Vietnamese "shaking" beef) but then realize that it is completely different. We dug right into the pickled cucumber and radish because it was done so well. The accompanying housemade chile sauce was welcome as well though much hotter than expected; it has plenty of dimension so portion it wisely. The beef was extremely tender and its marinade both savory and slightly sweet, making it a perfect combination with the crusty baguette slices. I'd say this is a must-try here. The other entrees we were unable to get to but came highly recommended from Nhu herself were the Hong Hai Style Steamed Salmon ($19.95) and Hong Hai Crispy Tofu ($9.95). The salmon is presented with all the accoutrements to make rolls - rice paper, fresh vegetables, and the like. The tofu has been compared to a melty cheese because of how soft it is. We'll have to try both of those the next time we're in! Other menu options include noodle dishes, vermicelli dishes, steamed rice combinations, fried rice selections, and even kids' meals. There ought to be something for everyone, and we even saw that with the diverse age and ethnic demographic coming in and out the doors. 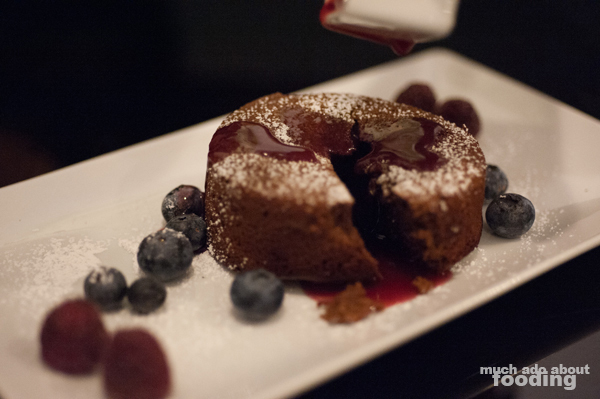 We ended with a plate of their Chocolate Lave Cake with Berries Sauce ($5.50; a la mode +$1.50), a dessert assuredly not inspired by the restaurant overseas but one that can appeal more to an American clientele here. We thought that the ganache inside was fair but the cake overall was a bit dry and lackluster. However, it is often raved about from others so perhaps we'll have to give it a second chance. If you are curious what the libation options are here for alcohol, Hong Hai does have a beer and wine license but not hard liquor so far. Promotions for wine glasses at the bar as well as special wine pairing events are on the horizon. 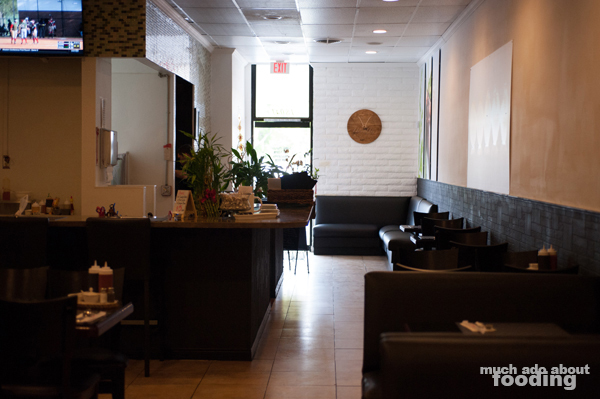 Also keep a look out for monthly specials where they will try to bring in more recipes from "Mom" and continue to serve up solid Vietnamese food. Find them at 18041 Magnolia St Fountain Valley, CA 92708 and remember to give their specialties a try!